Local police patrol a village in Hotan prefecture, in China’s western Xinjiang region, on Feb. 17, 2018. The Chinese government has pushed back at foreign criticism of its conduct in Xinjiang. 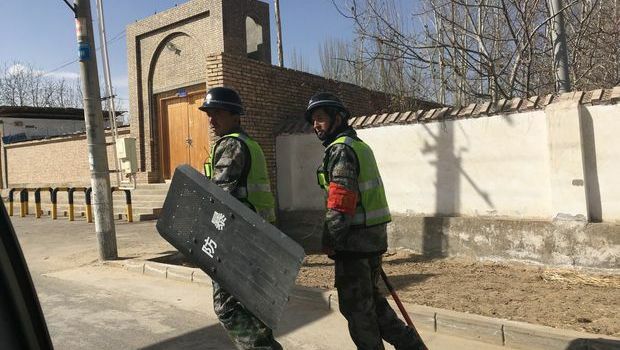 The Chinese government has rejected a diplomatic demand from a group of Western countries, including Canada, to discuss issues related to the Xinjiang region and conditions for the largely-Muslim Uyghur population there. 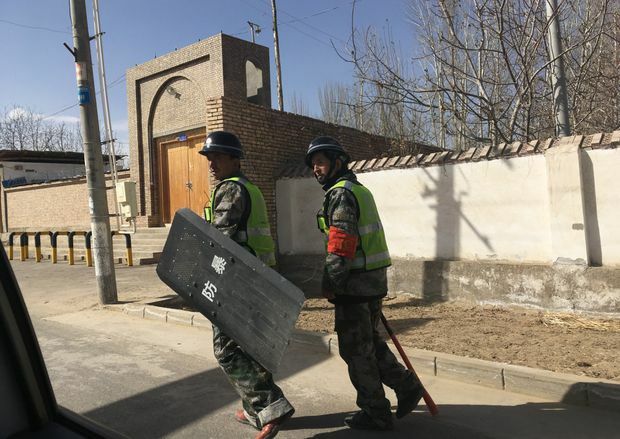 A new academic report, meanwhile, suggests the number of people detained in Xinjiang facilities used for political re-education appears to be in the hundreds of thousands – perhaps as many as one million. The report, by researcher Adrian Zenz, documents $138-million in Chinese procurement contracts for the construction, renovation and expansion of re-education facilities in Xinjiang. The total figure is likely much larger, as authorities oversee construction of hundreds of such centres at township, county and village levels, said Mr. Zenz, a researcher at the European School of Culture and Theology in Korntal, Germany. “Many bids mandate the installation of comprehensive security features that turn existing facilities into prison-like compounds: surrounding walls, security fences, pull wire mesh, barbwire, reinforced security doors and windows, surveillance systems, secure access systems, watchtowers, guard rooms, police stations or facilities for armed police forces,” Mr. Zenz wrote in an article published Tuesday by the Jamestown Foundation, a Washington-based non-partisan research and analysis firm. Such facilities are used to deliver political indoctrination, Chinese-language instruction and tutoring in other skills. Some are called “vocational training centres” but “frequently function as well-secured internment camps,” Mr. Zenz found. Indeed, he found that many regions recruited staff for such “training centres” in the same advertisement as police jobs. In some places, job ads demand Han Chinese applicants with only middle-school degrees but excellent political loyalty. Official documents have likened re-education to a kind of medical “treatment” for addiction to unhealthy ideologies. China has accused Uyghur extremists of conducting terror attacks and Chinese authorities have, in response, sought to combat what they call threats of radicalization in Xinjiang, including by expanding surveillance networks, installing numerous new police posts and equipping local authorities with devices that can search smartphones for content deemed illegal. 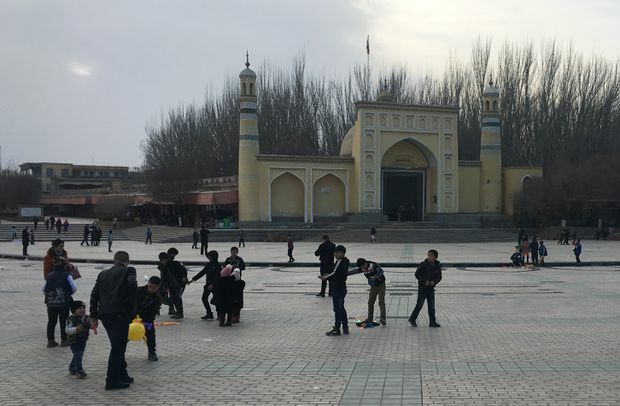 Children playing outside the Id-kah mosque in the Xinjiang region of Kashgar, China on Feb. 18, 2018. Documents show contracts for the expansion and installation of security features to re-education facilities in the area that will be used to deliver political indoctrination to the population. But their existence has been documented by scholars and news organizations, including The Globe and Mail, and has raised human rights-related concerns in the international community. The Chinese government, however, has pushed back at foreign criticism of its conduct in Xinjiang. Earlier this year, officials in Beijing rejected a démarche by a group of Western diplomats, including from Canada, France, Germany and Switzerland, to discuss issues related to Xinjiang, multiple diplomatic sources confirmed. 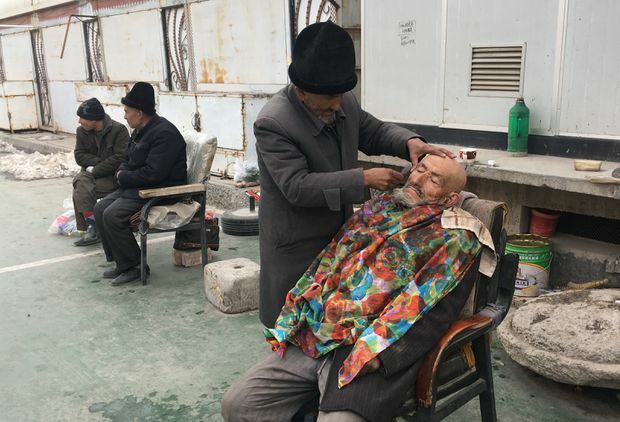 A barber shaves a man outside of the Id Kah mosque in Kashgar, in China’s western Xinjiang region, on Feb. 18, 2018. The Chinese government regularly boasts about the economic development it has brought to Xinjiang. Mr. Zenz’s research, however, suggests that at least 200,000 Uyghurs have been placed into re-education, and perhaps five times that. His numbers are based on Chinese government statements, estimates of the numbers of re-education camps, a survey of the square footage in construction bids, local informants and media reports. The broad range in estimates comes from a lack of official data. China has not provided numbers on how many people it has brought into re-education, and foreign journalists are routinely subjected to detention and harassment while reporting there. But Mr. Zenz located 73 procurement bids related to re-education facilities, which give “unprecedented detail” into a system that he calls “a mass social re-engineering project that’s trying to change a people, basically,” he said. Those sent to re-education can stay anywhere from several months to 15 months, he said.